Don't let the length of this recipe keep you away. The ingredients and methods are simple and there is very little hands-on time. In a medium mixing bowl, combine the raspberries, lime juice, lime zest, sugar, and salt. Stir to combine, cover, and chill for at least 3 hours. Stir before serving. Preheat the oven to 225°F/107°C. Line two sheet pans with parchment. In the bowl of a stand mixer fitted with a whisk attachment, combine the egg whites and vinegar. Set aside. In a medium mixing bowl, stir together the sugar and cornstarch. Put one spoonful of the sugar mixture in to the egg mixture. Mix the egg whites on medium-low until foamy, then turn the mixer to high until medium peaks form. Once the mixture has formed medium peaks, start adding the sugar one spoonful at a time. Wait to add the next spoonful until the the sugar is fully incorporated and the mixture is back to the medium peak texture. When all of the sugar has been added, add the vanilla and coconut extract. Continue mixing on high for two minutes. The mixture should have very stiff peaks. Using a cookie scoop or a serving spoon, scoop the mixture on to the prepared sheet pans. Each dollop should be about a 3 inches in diameter. There should be six meringues on each pan. Use the back of a spoon to make a small well in the center of each meringue. If the spoon gets sticky with meringue, rinse it off in cool water. Sprinkle the edges of the meringues with the coconut flakes. Bake the meringues in the middle and/or top of the oven for 1 hour and 15 minutes. When the baking time has elapsed, turn off the oven, and leave the meringues to cool in the oven with the door closed for 30 minutes. After 30 minutes, crack the oven door and cool completely before removing. Use immediately or store in an airtight container for up to two weeks. In the bowl of a stand mixer fitted with a whisk attachment, combine heavy whipping cream, cream of coconut, sugar, vanilla, and salt. Mix on medium until slightly thickened. Then, turn the mixer to high and mix until it is thick and smooth whipped cream consistency. Use immediately, or store it chilled for a few hours in the refrigerator. After the meringues are baked and cooled, dollop each meringue with a generous spoonful of the whipped cream. 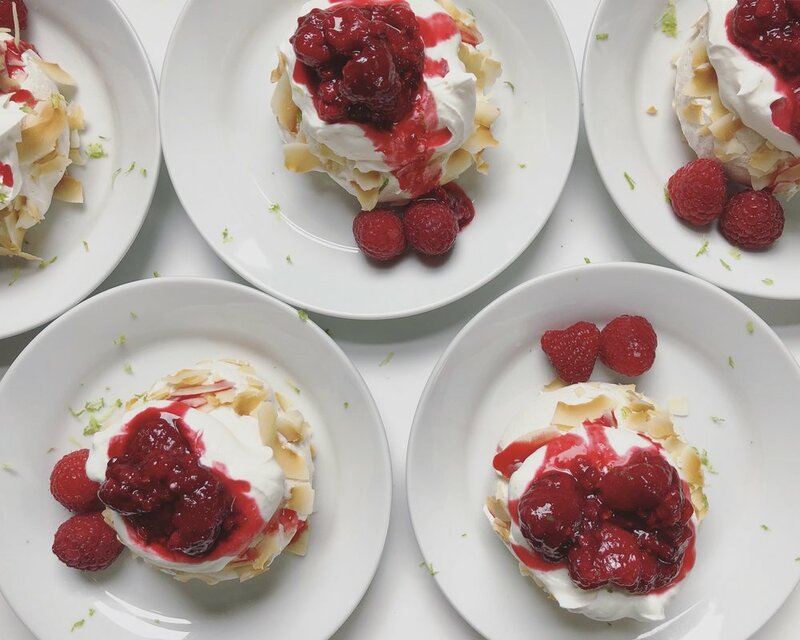 Top the whipped cream with a spoonful of the macerated lime raspberries. Serve garnished with a little fresh lime zest and a couple of fresh raspberries on the side.